Traditional caramel apples are topped with peanut butter cups, chopped peanuts, and semi-sweet chocolate in this nutty, sweet-and-salty treat. The combination of crisp apples, chewy caramel, rich chocolate, and crunchy nuts is delicious and will suit any fall party or get-together. Place the chopped peanut butter cups and peanuts in separate bowls and set aside for now. Remove the stems, and stick the skewers firmly in the stem ends. Microwave for 1 minute, then stir; microwave for an additional minute or until completely melted. The caramel should be smooth and very fluid by the end, so continue to heat in short intervals until it is a workable temperature and consistency. If necessary, use a spoon to pour caramel over the top so that the entire apple is covered. Bring it out of the caramel and twirl it upside down to remove excess, then set it on the prepared baking sheet. 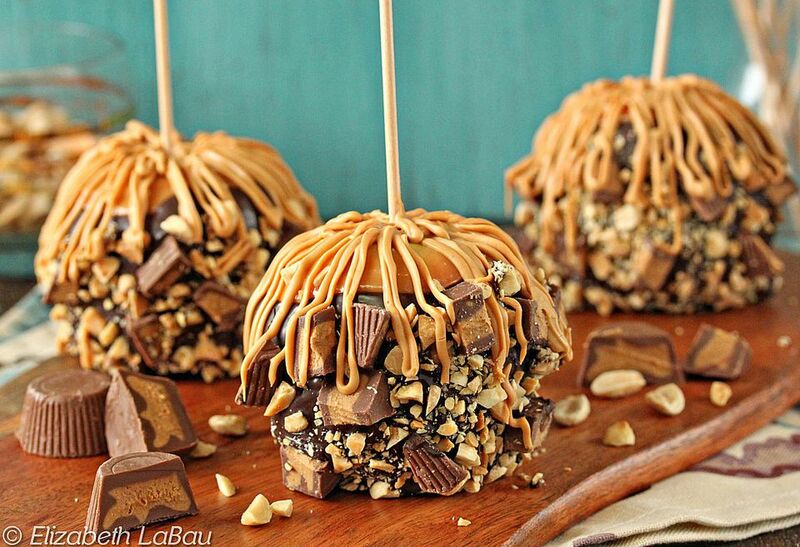 Dip the caramel-covered apple in the chocolate, until the caramel is almost entirely covered. If it helps, use a spoon to pour some of the chocolate over the caramel to get even coverage. While the chocolate is still wet, press some chopped peanut butter cups into the chocolate, and sprinkle the chopped peanuts evenly over the wet chocolate. Place the apple back on the baking sheet and repeat with remaining apples. Place the peanut butter chips and coconut oil in a small microwave-safe bowl and microwave until the chips are melted, stirring after every 30 seconds to prevent overheating. Transfer the melted chips into a small plastic bag and snip off a small corner of the bag. Drizzle the peanut butter chips in a thin line over the top of each apple, radiating out from the center, for a beautiful finishing touch. Refrigerate the apples until the peanut butter sets -- about 15 minutes. If you will not be serving the apples immediately, tightly wrap them individually in plastic wrap and store them in the refrigerator for up to a week.